Our facility sits on the doorstep of nature, and we are very mindful of our impact on the environment. 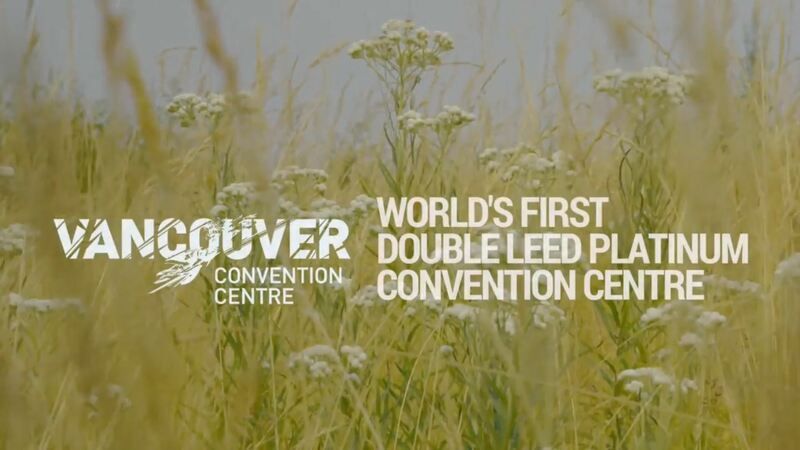 From the design of our double LEED® Platinum certified facility, the use of the latest green technologies to the adoption of green operating practices, the Vancouver Convention Centre is committed to being as environmentally sustainable as possible. We’re proud to be the world’s first double LEED® Platinum certified convention centre. Here are a few reasons why we are truly green by design. The West building’s six-acre living roof – the largest in Canada and the largest non-industrial living roof in North America – features more than 400,000 indigenous plant and grasses. Our unique roof is designed to act as an insulator, reducing heat gains in the summer and heat losses in the winter. The roof is also home to four beehives with European honey bees. The bees help pollinate the plants on the living roof while supplying honey for our ‘scratch’ kitchen. A restored marine habitat is built into the foundation of the West building. Water quality in the area has improved dramatically, with the growth of a large variety of sea life. Our sophisticated black water treatment plant recycles grey and black water that goes back into our washrooms for toilet flushing and is used for rooftop irrigation during warmer weather. Our seawater heating and cooling system takes advantage of the adjacent seawater to produce cooling for the building during warmer months and heating in cooler months. Natural light and ventilation are maximized throughout the facility. Local BC wood products from sustainably-managed forests are used throughout the facility. Our commitment to the environment doesn’t stop at our building features and technology. Ensuring sustainable practices daily is something we also take pride in. Most recently, we are proud to have been recognized as the first Healthy Venue in the Americas by the World Obesity Federation for our commitment to providing a healthy offering for our staff and guests in terms of food and well-being. We run an extensive facility-wide recycling program that includes organics. We operate a ‘scratch’ kitchen using primarily fresh, local and seasonal ingredients. Promoting and using locally-grown products means less energy consumption for transporting products to our door. We encourage our purveyors to deliver their goods in reusable containers and work with suppliers with a strong commitment to the environment. Green SealTM and EcoLogoTM approved cleaning products are used facility-wide, including in the kitchen and food service areas. We want to help you take full advantage of our green facilities and programs. Here are some resources to get you started. Email us for more information on our sustainability practices.